Beautiful made drapes. They look more expensive then in the picture. Create a sophisticated look in your dining room with this blackout curtain panel from EFF. 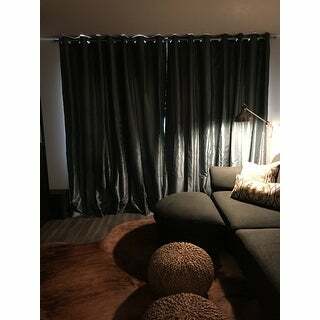 This curtain panel features textured faux silk dupioni fabric accented with grommets in an elegant nickel finish. The panel's soft, fluid fabric create an airy feel in your room. Multiple color options offer versatility, making this faux silk curtain panel easy to match with your existing dining room decor. A plush blackout lining helps filter sunlight to save energy, making the panel ideal for insulating your home and perfect for late sleepers. With its grommet construction, this window panel offers easy installation for your convenience. Color is perfect. Texture was very nice. These made my living room. I had originally thought to hang four panels but my installer thought they would be too heavy with only one center support so I ended up hanging only two and leaving them open. I bought the 96 lengths. These curtains are lovely. The Dupioni Faux Silk looks like real silk. The blackout lining is supple, not stiff. The curtains hang nicely in my living room. Am probably going to order more for the guest room and office upstairs. I was trying to find faux silk drapes to match an existng comforter set, and I struggled to find the right color drapes and grommet color-AND finally these panels look soooo nice!! I love these panels. I purchased in a different color for another room. The are a beautiful shade of peacock/ teal. They are listed as green in the options but once you select green it reads peacock which is true to color. Love these curtains. They look great in my bedroom and the blackout is great. The color is perfect and I would definitely order these again for other rooms. I was skeptical because of the "faux silk," but it really does look like the real thing. The blackout lining isn't perfect, but my windows do get direct afternoon sun. For the price, these are actually pretty great. About to order another color for a different room. Photo below taken around noon on a sunny day. 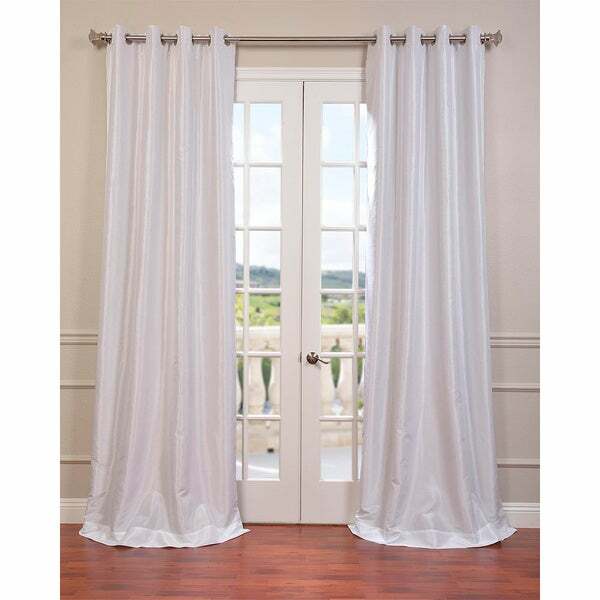 I bought these for our bedroom patio door. Our room faces west, so we get a lot of light and heat at 3-4 pm. These are good at darkening the room but do not blackout it out and we have tint installed on our patio door as well. It might be fine if you get an average amount of light through your window/door...but we get a direct hit. The material is beautiful, the grommets are satin and they are weighted...which I like. They are not very shinny, they have a shimmer though. These do not feel cheap at all, I am not a person who believes in spending hundreds of dollars for window covers. So I try to look for something affordable, yet quality and these are great in my eyes. I was looking for a color that would go with blues, grays and silvers. The ice color is perfect. And they are room darkening which is what I was hoping for. i guess i should have read the fine print, but when the picture shows two panels, and the curtain costs $*, i thought it was safe to assume i was getting both panels. otherwise, $ x2 isnt a great "deal" for curtains. I lost $ returning the items (three "sets", which turned out to be individual panels, and which were shipped separately. soooo that was an expensive and not worthwhile loss for me. Light and heat are totally blocked. More than expected. Loved the material! Very elegant, just wished they had been a little wider. Might have to order another pair for the FULL black out effect. These curtains are really nice. They definitely block out the light too. They are excellent quality and are quite thick so I imagine that it helps with insulation as well. Definitely recommend these curtains! These are great. This is for a bedroom in Arizona where the morning sun is an issue. They really keep the sun out and are a really pretty faux dupioni. Recommend! Weighted, light and heat blocking are excellent. High quality, high end look for a fraction of the cost. These curtains are thick. They have a gleam to them. They hang beautifully and get alot of compliments. Wonderful draperies. 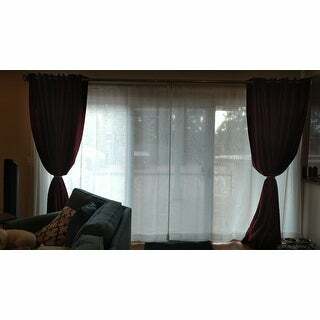 They provide total blackout and are very heavy, durable curtains. They hang well and the fabric is very luxurious! I highly recommend! "Are their weighted hems on these curtains?" Yes, this panel has weighted hems. "Is the white a bright white? Are they lined with white or the ecru?" They are bright white and it's lining is also white. "When will the 96" in smokey plum be back in stock?" The 96-inch smoky plum is in stock. It is located in the drop down menu, under options. "I originally ordered 4 panels for a window but I don't want two center brackets. How heavy are these drapes. Can I get along with one center bracket"
Yes you most certainly can. I have 4 panels and only used one bracket providing the rod is at least one inch in diameter. "Is the back the same as the front, or is there a white (or other color) lining?" Never mind, found my answer in the description: ecru-colored lining. Posted a question too quickly! "Are the off white more of a cream color or more natural? They seem to have a shade of yellow. " I would call them ivory. "So this price is for ONE panel or a pair?" This is just one panel.